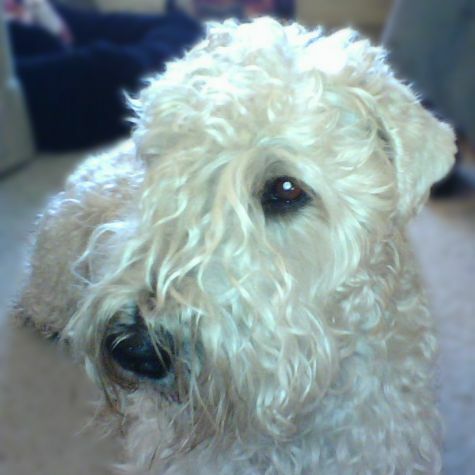 I am Max, a Soft Coated Wheaten Terrier. After being tossed around by Santa Ana winds and falling off my grooming table, I was awarded the title "Knight of the Round Puppyhood", and eventually became a member of the Elite Airborne Puppies. Wheatens don't run; we prance like deer, and we don't jump; we fly over stuff. We are famous for our Wheaten Greetin'. I am proud to be the only Wheatie I know who has become a hospital-visiting Therapy Dog Volunteer Team with my Mom.